Coveney also suggested that the abortion referendum could be held a week earlier than expected. TÁNAISTE SIMON COVENEY has denied doing a U-turn on the abortion referendum. Coveney changed his stance on the government’s legislative proposals for abortion on Monday. Writing in the Irish Independent, Coveney said he now supports access to terminations up to 12 weeks after speaking with Health Minister Simon Harris and “senior clinicians”. 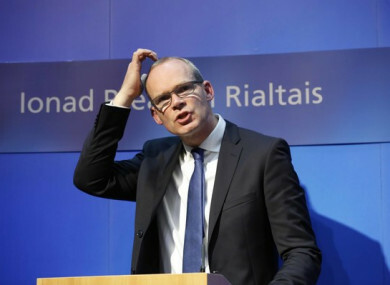 Coveney has been criticised by anti-abortion campaigners who are accusing his of flip-flopping on the issue. “People who are campaigning for a No vote in this election are going to try to gain any advantage they can. I don’t categorise it as a U-turn at all. I couldn’t support the 12-week proposal unless it was accompanied with what we have got yesterday now from the Minister of Heath – which is a very strict and detailed protocol which involves a lot more time for consideration. Coveney said his concerns are reflected across the country and that he was stopped many times over people’s concerns about the 12-week proposal. He added that the proposed law now means that if the Eighth is repealed “late-term abortions now will not happen in Ireland”. On Monday night, Coveney called for the inclusion of a two-thirds majority lock that would be enacted if the Eighth Amendment is repealed. Yesterday Taoiseach Leo Varadkar described the proposal as “unconstitutional”. It’s understood that the Tánaiste did not brief the Taoiseach about his proposal before floating the idea. I was never proposing, and I am not proposing today, that we would tie the hands of any future government. However, on Monday night a spokesperson for the Tánaiste said he was “looking for a two-thirds majority to be necessary if there was ever any attempt to alter the law in the future. “To put that into context, that is more than the combined strength of Fine Gael and Fianna Fáil in the current Dáil. Coveney also suggested that the abortion referendum could be held a week earlier than the expected date of 25 May. “Once the legislation passes through the Seanad, we’ll be able to announce a date at that stage. There are two possible dates that we’re looking at towards the end of May … not necessarily the last Friday, it could be the second last Friday. Yesterday Cabinet approved the draft laws they would try to bring in if the Eighth Amendment is repealed. Email “Tánaiste denies doing a U-turn on abortion”. Feedback on “Tánaiste denies doing a U-turn on abortion”.